Tuesday text from Keith: Saddle up. The day has arrived. After receiving Keith Back’s text, I reflected on the previous night’s preparation, which was simply delivering a trunk full of Costco pies and bread. Sounds like a party to me as I’m always down for pie. Yes, the day had arrived. 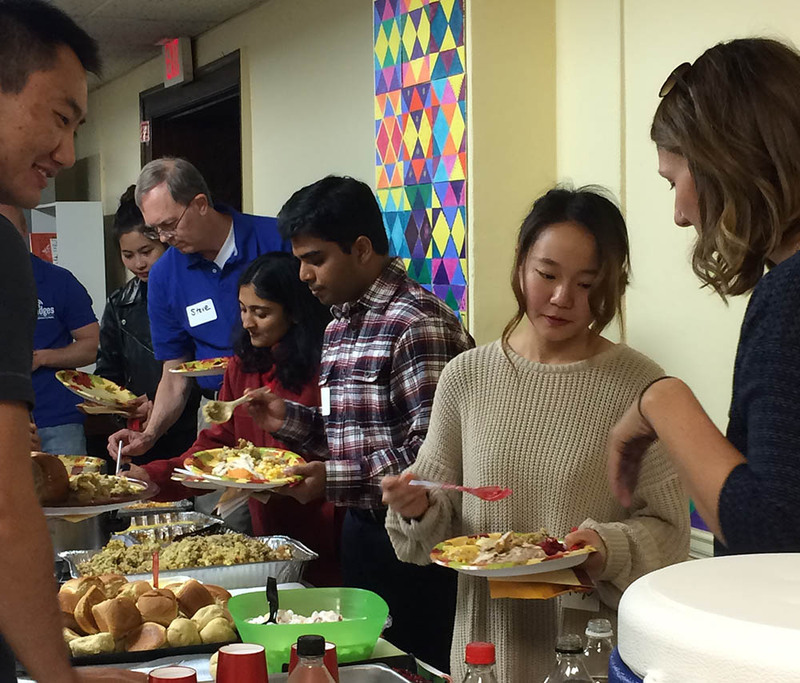 CRU/Bridges International was hosting their annual Thanksgiving gathering for International students from IUPUI and U Indy. An open invitation to hear about the origins of Thanksgiving and eat an American meal like no other. Perhaps the only missing element would be a Dallas Cowboys game on TV in the other room. 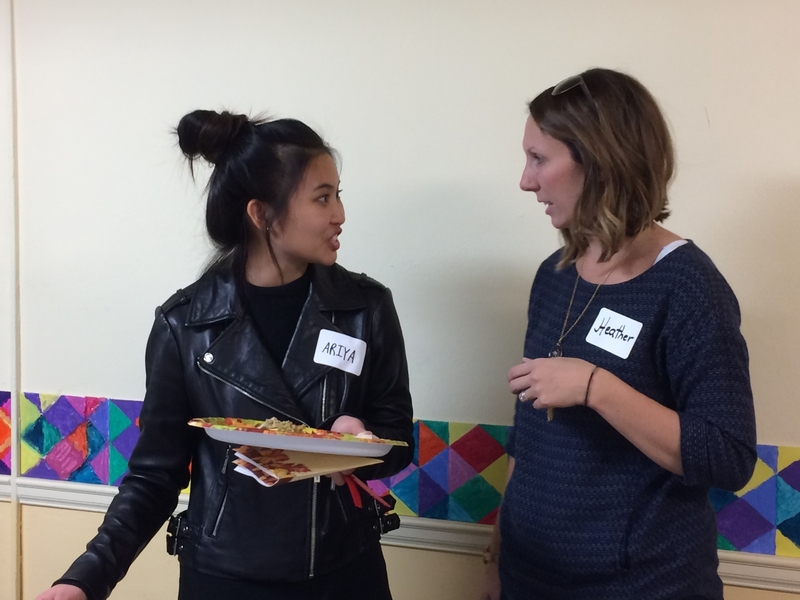 Keith and Natalie Back are vocational missionary partners at Grace and extended the invitation to the congregation to join in serving a meal in the basement of Roberts Park United Methodist Church. As a friend of the family, I was glad to be a part of it. My text back: Had one of those moments this morning where God was just saying “Do your thing, but watch Me work. Also, know you are there to receive as much as you are there to serve.” Brother, let’s get blessed and bless others. Turkey, stuffing and, oh yes, pies arrived. Passenger vans arrived. Students of the nations arrived. We are talking about Kingsley and Isaac from Nigeria, Wong from China and Hiroki from Japan. More countries were represented from Costa Rica, India, Iran, Iraq, Russia, South Korea, Thailand and still more. It was fascinating as languages and accents were from across the globe, but cultural barriers or divides were never really felt. After Dr. Rick brought the historical premise of Thanksgiving, we broke bread and fellowship was in session over plates of turkey, stuffing, green bean casserole, sweet potatoes and pies! There was a familiar fragrance of Thanksgiving in the air, but it was an unfamiliar scene of those assembled. Yet, the mood was lighthearted and the atmosphere carried warmth and an invitation. 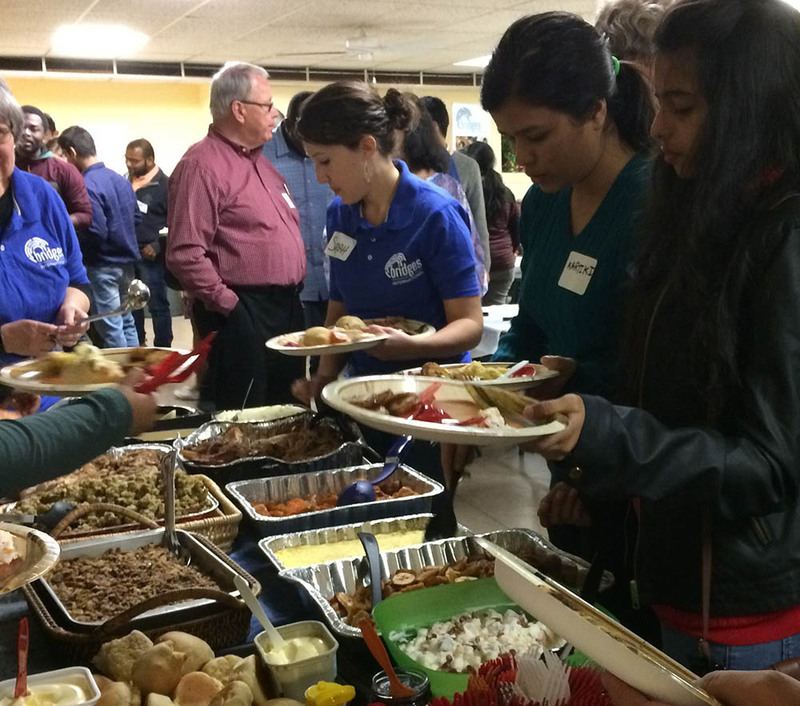 The young children of families serving played and brought an authenticity of a family meal. As a gathering of both believers and non-believers, God was present which just humbled the room. Really, I wasn’t sure what I was going to be doing as my primary objective was met in delivering food provisions from my Grace Group. As the meal was ending, Ron Stohler stood up and invited everyone to hear his story how God met him and changed the course of his life. His words not only captivated the room, but seemed to turn this invitation to hear his testimony into a personal calling from God to each one there. I was stirred how the polite attention became conviction. At the next invitation to serve, grab some turkey, do your thing, but watch God work and you’ll get blessed. To learn more about Keith and Natalie Back’s ministry with international students, contact Keith at keith.back@cru.org.